For Virtual Assistant Ronald Ramboanga, the event was doubly successful. Besides gaining knowledge and ideas on how to set up his own business, Ronald received a message that he has been hired by an employer at OnlineJobs.PH. The offer was for a full time position as a Virtual Assistant. Like office career applications, a simple resume is sometimes not enough. Ronald advises that as an applicant, you should be conscious with the contents and details of your profile which will be seen by possible employers. It can be as simple and concise as you want, but the important information should all be there. For as long as these details are specific and true, employers will immediately see if they will consider you to be hired and give you the job. Although it took several months before a good offer came along, it was clearly worth the wait. He was hired for a full time post with a respectable starting salary. Ronald’s client was very impressed with his skills and experience that he was hired immediately. 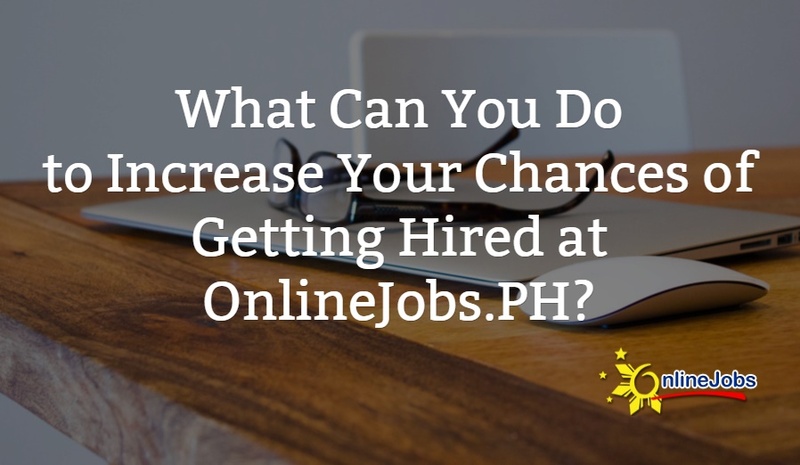 He wants to share his enthusiasm to other OnlineJobs.PH job seekers by giving these tips. d. Rate your skills with with honestly. “Thank you very much OnlineJobs for serving as a medium for me to get a full time job opportunity. With the type of services you rendered to online workers, I am given the privilege to work anywhere I want as long as I am comfortable to accomplish my duties and responsibilities. Your platform is what Virtual Assistants like me is looking for. I’ve been hired because clients trusted my profile since these clients already trust OnlineJobs.PH,” Ronald concludes. You too can start a work-at-home career at OnlineJobs.Ph like Joven and Gabby. Just create a free jobseeker profile at www.onlinejobs.ph and you’ll have access to hundreds of new jobs everyday! I’m gonna apply on onlinejobs soon. So timely. Thanks for the tips. Thank, you. Glad you found the blog post helpful. Do update us when you get hired. Good luck! Hello! Can I ask if the I.D score of your client is 30 is it still reliable? Many thanks! hi mam julia jasmin i`m new at online-jobs i post my information and i have present job i would like to work part time only…i`m a single mother raising my daughter… since online-jobs lot of opportunity pls. help me to find a part time job.. I already registered with the onlinejobs.ph but every time im looking for a job matching on my qualifications this message “Your ID Proof is lower than required to apply to this job” always appear. How can i change my ID proof so that i can apply for any jobs suite to me? Hi, i have an account with onlinejobs.ph but it seems employers are not interested with jobseekeers who dont have any experience. I jusy wonder how can I have an experience if I am not given a chance? Appreciate your assistance on this please. Thank you. May I know why is it necessary to upload any Gov’t ID? The gov’t ID helps reassure employers that they are hiring a real Filipino online worker and not a scammer. Don’t worry, the details of the ID are blurred and will not be seen by the employer. thanks for the reply. until now no one is getting me even for a virtual assistant. I can perfectly relate with Mr. Ronald Ramboanga. I happen to look for a job through OnlineJob.Ph third week of June 2014 and got hired Fulltime on July 29, 2014. Not quite a long journey of trying and competing to get hired. I created my profile and upload the necessary documents, profile picture and took several online tests to comply in most Company’s requirements such as DISC, IQ Test and Basic English Tests. Not to mention, the more tests you are taking which yielded good scores, the more competent you will become as a Jobseeker. The more chances you will get hired! There were several Employers whom I underwent series of interviews, but of course, it is the process of Job Hiring. There will be individuals who will advance to the next round of interview, and there will be eliminated along the process. It was mixed emotions while getting to the final interview, at the same time, it is boosting my confidence as I usually get kind words and appreciated as to how competent I am as a VA. Despite of the good scores and good results in the interviews, there are more individuals better than we thought we are. Don’t get frustrated, it’s just part of the process. Don’t lose hope! There are much more opportunities in OnlineJob.Ph where you are perfectly fitted to a certain Job. Just keep on searching and equip yourself with boosting confidence, work on your profile and be honest as possible during interviews, also, it is important that your hard work should be coupled with faith in God. It’s worth the wait! I landed to a very considerate and very kind Employer. In return, I am doing my best to be worthy of his trust and his gratefulness. In fact, we are looking forward towards a long term working relationship. So guys, what are you waiting for? Try the different opportunities OnlineJob.Ph is offering. Goodluck! may i asked how can i get job in here i just click and register ..i have my account already next step i dont know what to do hehe?please help me thank you. You can apply for any of the jobs posted here by signing up for an Onlinejobs.ph jobseeker account. It’s completely free and takes only minutes to apply. Having a jobseeker account also gives you access to thousands of new online jobs daily. Once you’ve completed your profile, you can start searching for the job that you want here ===>http://www.onlinejobs.ph/jobseekers/jobsearch/ The job posts contain all the information you need to apply for the position. Hope this helps. Take care and good luck on your job hunt! Ask ko lang po what type of job po ba ang pwede sa katulad ko pong high school students? But ideally, it would be best if you finish schooling first before you apply. That way you’ll have more skills, have more time to work, and earn better. How to tell if the job post is for real? so that we won’t waste our time in sending them applications specially those who have long questionnaire. I noticed some of them are just getting your contact details. I hope you can filter also these bogus employer who pretend to post jobs opportunity. I’ve seen lots of job postings that asks lots of questions, too much instructions on how to apply, etc. only for an amazing offer of $200++ (full time). Hope the site can screen the postings well. Got some questions here and hope someone would be kind to answer my queries as I am just new to this virtual jobs. 1. Where can I find those online tests like those DISC, IQ Test and Basic English Test? ID Proof is our system of verifying jobseeker identity. Basically, the higher your ID Proof score, the more sure we are that the jobseeker profile belongs to a real jobseeker and not a fake. You get an ID Proof score once you sign up for an Onlinejobs.ph jobseeker account. Hi, how would I be able to get my ID PROOF to 99? I’ve uploaded all the ID’s required, picture, FB connect, Skills, CV. pretty completed my profile but still my ID PROOF is low reason why I can’t apply to any job, I was already having doubts that this isn’t for real, but a few days back my friend told me that someone from Onlinejobs.ph messaged her and she was able to work and her profile have 99 ID proof and knowing that she only opened her account 3 times. I need help. thanks. After updating your profile, the ID Proof score does not get updated right away. It usually takes us a couple of days to verify the information. But it will be automatically rechecked by the site in a day or so. Same problem with me. Already added everything but mine is still below 50 and have been for a few months now. What can I do to improve this? Thanks! Please email support@onlinejobs.ph. If it’s been months after you made updates and you still don’t see an improvement in your IDProof score, it’s possible there might be a different issue affecting it. As someone who has employed several VA’s over the past 2 years, I can tell you that the biggest factor next to skill is trust. fifty percent of the VA’s we employed proved to be unreliable by not showing up for work or having many reasons why the task was not completed in the agreed time allocated. I’m happy to say that the other 50% were absolute treasures to work with, friendly, reliable and competant. Most of all, enthusiastic about doing the job. I will be looking for another VA this year to add to our company. Good Day! I would like to find an online job but doesn’t know where to start. I am an Accounting major and an MBA major in Entrepreneurship. Hopefully, you can help me. I would be grateful. Hi, I’m glad I found this blog of yours. I’m also having the same problem with them but still i am waiting for my ID Proof score to be validated. Thank you. I need a job. Please help me get referred. I have been applyung since 3 months and atill has no job. I am a hardworking person and you can trust me. Please help me i need a job. I am new on onlinejobs, a week ago. I just want to ask if I had to upload my real resume documents for any referrences of the employer? I realy wanted to get a job on this site. I already applied some of posted hiring. And that is base on my working experience. Im just wondering if I still need to upload my resume, just like the normal application. Any suggestion from you guys is very much appreciated. You don’t need to upload your resume on our site but it would be best to still have an updated resume with you in case an employer asks for it. Good day everyone I already have an account I already take the test, put my id government complete, but why I don’t have Id proof It’s zero.What should I do? So sorry to hear that. Please email our support staff (support@onlinejobs.ph) regarding your ID Proof. Don’t forget to give them your jobseeker profile or the email you used to register for the account so they can track your profile. I can’t find the site ma’am. If you can’t find your profile, just give them the email address you used to register or your full name. I created my profile a few days ago and started applying for jobs. Now, I don’t have enough ID proof anymore to apply for more. Are there ways to increase my ID proof? Just make sure your profile is complete and accurate and your ID proof score should increase. It’s really important that your profile is complete, this means having a photo and government ID. Paano po ba mapapataas ang Profile ko dito at Paano po ba ako babayaran ng Client na tatangap sa akin sa online job? That seems like a technical problem. Can you send a screenshot of the issue and email it to support@onlinejosbs.ph? They can help you with regards to uploading and blurring your ID information. Hi there. I think I have done something wrong. I haven’t been reading stuff here before applying for a job so I was able to send a couple of application minus a sufficient covering letter which I belatedly realized. That was not proper, right? Anyways, I hope I can make amends with the next ones with whom I’ll be forwarding my application. It’s a lesson learned for sure. I would like to ask how can I find the permalink of my profile from onlinejobs.ph? Your help is highly appreciated. Thanks! To help you with that please contact our onsite chat support or our social media support on Facebook and Twitter. Pwede ba ma hired dalawang employer sa account ko? That depends. If your first employer would allow that your profile to show that you are still open for hiring, then yes you can be hired by another employer. I have the same problem with Mae. I was currently hired by a client on a part time basis. However, another job opportunity I applied to would also like to hire me part time. Do I have to ask permission from my current employer about that? I am also hired part time, but now I want to be able to get another part-time job. Does my current employer have the ability to declare me as his/her employee and declare that he/she won’t allow me to get another job with another employer? Even though you are hired part-time, you can get another part-time job. It won’t be a problem. I just registered yesterday.. when I went back to my account it was showing my ID Proof is 39. I also decided to link my Facebook account, then my ID Proof updated to 33. Is this good? Actually I wanted to apply for a job posting but it was saying my ID proof is lower than required by the employer, it was posted ID proof 50. Highly appreciate if you can help me out. I’m on the way of searching a job in Online Job.ph, How do I submit my application with an ID proof? Thanks. Is it okay to use a pseudonym or are we required to enter our full name in the personal info? It’s much better if you use your real name in the personal info. The online jobs offered here are real jobs, with real salaries. So if you use a pseudonym, your salary might go to someone else. The article keeps referring to Ronald as a man. But the photos say otherwise. My id proof was 54 and I want to apply for a job post which requires 55 id proof, then I connected my facebook account, but after that , instead of incresing my id proof became much lower like 48. Why does that happened? Maam gusto ko sanang mag apply, but wala po akong experience like sa BPO agent , do i qualified po.. Interesado po kasi ako . I already have an account here in onlinejobs.ph a month ago. My ID proof is high at 99 and done some online exams.I currently employed in the corporate world as vehicle finance coordinator and wanted to earn some extra income by working home base after my office hours until I can make it full time. But my problem is I don’t really know what exactly job position should I consider applying except data entry. Any tips from you guys! Mam gud ev. I am asking for help to edit my profile its not yet complete. I would like to add more information. Thank you. Just login to your jobseeker profile. Once you’re logged in, look at the right side column. There’s an “Edit profile” tab there. I have also some doubts about giving a government issued ID. One person I have read in the news gave his ID, and in the process, someone got money from GSIS by using his ID. I will have to register very soon. We are aware of that incident. Which is why we now blur out gov’t ID that are now uploaded in our database. We don’t have age requirements but we generally recommend that workers to be 18 and older. When you edit your profile, you’ll see a set of numbers near the end of the URL. That’s your jobseeker ID. That’s the number you can send to employers. It is so sad, my first interview in home-based job is unsucessful! I was not passed the interview because of my english is very poor. Please help me to find job which fit my qualification. I need home-based job. hi, is it possible po ba na i can be hire by an employer kahit n ang experienced ko po ay last 16 years n i really wanted to have job how po kaya? I am an BSECE graduate. There are employers that are open to hiring jobseekers without experience as long as you have the time, right skills, tools, and the right attitude for the job. I need help, I tried connecting my facebook profile to my account here and my ID proof scores went down from 60 to 47. The reason I’m seeing here is I used my facebook account for work rather than the personal one. Is there any way to undo or improve my ID score. I will also upload govt. IDs once I updated my surname. Thanks in advance. Yes, that definitely could be the reason. What you can do is email support@onlinejobs.ph and request for them to reconsider your IDProof score. Inform them that you have a separate work FB and personal FB, and that the profile you used is your work Facebook profile. I am new to this site,just want to ask if the message box that we found when we click apply,i thinks its a box after the subject,,is same as a cover letter? Or can you pls provide us a sample for this particular part? Yes, That’s where you write your cover letter or application letter. Hi! May I ask how can I put my resume in word 2016 or pdf formats on my skill summary field? do your field support html or css codes in order to show my documents as images here? Unfortunately, you can’t attach any documents in your skill summary field. What you can do is upload your resume or portfolio to Google Drive or Dropbox and leave a link that allows employers to view your resume. do I need to blur any important info my government i.d? Hi, I noticed that my ID proof score decreased from 97 to 87. I just uploaded my gov’t id. What could be the reason for that? We regularly do manual verification for IDProof to ensure that the information shared is accurate. When there’s a major change in the profile, we lower to IDProof score temporarily so we can put it in our queue for verification. But don’t worry. Once your profile is verified (24-36 hours), we will adjust the ID Proof score accordingly. It’s been more than 2 weeks since I register with onlinejobs.ph. My proof ID still did not increase even I provided all the info needed like facebook url, gov ID and took the tests. After updating your profile, the ID Proof score does not get updated right away, but will be automatically rechecked by the site in a day or so. If not, please email our support staff (support@onlinejobs.ph) for follow up. How do I increase my ID Proof? Hi. I just want to ask if what government ID can I put? I’m still studying college so I don’t think I have any Id to show except my school ID. I will be waiting for your response. Thank you. Instead of a government ID, you can also submit an NBI clearance. But even as a student, you can actually start the process of getting a government ID (SSS, driver’s license, passport). Having these government IDs will be really helpful when you start applying for a job. I just want to know if I can upload my Digital Postal ID as my govt Id in this site? I’ve been trying to download the video in the govt id section but I just can’t. Thank you for the full information. Hi. I just wanna ask, are the mode of payment always in Paypal? I don’t still have a credit card as of now and I don’t know how will it be. Mode of payment for employees isn’t limited to paypal. There’s also Western Union ad EasyPay. And you don’t need to a credit card to verify your Paypal account. But it does hae if you at least have a savings account. What if you are already hired as full time by one employer, is it possible to apply again a full time by another employer? It’s not possible but we don’t encourage it. Holding 2 full-time jobs would be very difficult to manage and not give you enough time for your family. Hello! I already took the IQ Test but unfortunately I wasn’t able to get my score and I wasn’t able to do a screenshot of the result. When I was trying to return to the page, I couldn’t go back anymore to see the result. How do I get my IQ Test results since retaking the test is not allowed? When we want to apply for a job and we click the job posting link, we will go to the Contact Employer page. I just want to ask what we should put in the message box? Is there a required template to use or just freely introduce yourself and that your interested to apply for the job? I am hoping for your soonest reply. Thank you! Just introduce yourself and inform of your intention to apply. You can write your cover letter there. Hi, paano ko po mapapalitan yung account ko na employer from employee mali po yung paglagay ko ng application eh. Sana po matulungan nyo ko. Thanks! Hello Julia! I wasn’t able to upload my resume on my account, can I send it through email through support@onlinejobs.ph? Anticipating your reply the soonest time possible. Thank you. Resume uploads are no longer a feature for jobseeker profiles. What I recommend is you upload your resume to Dropbox or Google Docs, create a link for viewing, and share on your jobseeker profile. Hi! I just created an employee account a few minutes ago. But I’m still in the process of completing my personal information as well as my skills forn. I do hope you could help me with my dilemma. Do you think I can still be hired, even though I was terminated? I was a Customer Service Associate in a BPO Company for almost 5 years and was terminated because of AWOL. Your advice and assistance would be greatly appreciated. Thank you and God Bless. When asked, you can explain to the interviewer or hiring manager why you went AWOl and whether that termination is justified. Hi! how do I blur out my government I.D? hi why cant i view the contact details of the graphic designer i want to hire? How can i post job because im looking for a graphic designer? I’ve been in onlinejobs for a month now. I even had a probationary job because of onlinejobs but my i.d. proof is still lower than 50 how can i increase it? Hi mam, how can I increase the score of my IQ test can I retake the test and how? Just go back to the website where you took the IQ test to retake it. What steps should I follow to retake the IQ test? Hi, I tried already to apply to different job openings but as of now still no replies yet even to the simplest job I applied but no updates why is it happen, is it because my ID Proof is 40? Does it mean I am not qualified? Hello, another question where can I view my ID Proof score in My Account Profile just to be updated from time to time of my score. Once you are logged in to your jobseeker profile, it should appear there. If you can’t see your IDProof score, it’s possible that you may have registered for an employer acocunt instead of a jobseeker account. Hello! How can I increase i.d proof in my profile? hi! I have the same problem. I have already uploaded everything including a govt id (passport) but in my passport I was still using my maiden name. my id proof is 63 I want to apply for a job with an id proof of 70. pls help me how to increase my i proof. it has been 63 for how many weeks now. how many days my ID proof will update? i answered my IQ test, english test and DISC almost 4 days ago but until now my ID proof is still the same. I have the same concerns. I linked my Facebook page and got an ID Proof score of 60. And then I took the tests, added my scores and screenshot, and also added a government issued ID, but still my ID Proof score stayed at 60. Kindly look into this matter so we can maximize the use of the site. Thank you. Have you reported this to support@onlinejobs.ph? Hello, Ms. Julia! No, not yet. I never thought of it as an error but I have always wondered how to get the ID Proof score higher after providing all possible information. I will do that now. Thank you! I just got hired by one of the employer here looking for a customer service support however she did not ask for my resume or anything. She didn’t interview me as well. Now I started the job, and I don’t have any proof to her that I’m online and waiting for a call. We got Timeproof here and I downloaded it but it does not says that I have an open project. what could be the issue here? Please help. You can email support@onlinejobs.ph to check if that employer has an open project with TimeProof. Please include the employers email. I am already being interviewed by an employer for a VA post. I just want to know how I can make sure that this employer is totally legit and that he would pay me for my service. I would really appreciate your response. 🙂 Thank you! Hi, there! I have opened my account few years ago but I was not able to pursue my career in home based jobs due to some technical problems. Recently, I have already re activated my account. I just want to ask if I should create another account and deactivate my current account? Because client might have an impression that I was not able to get a client ever since. I have past experiences but not in home based jobs. It would be best if you just activate your account. You are not allowed to create new or duplicate accounts. Regarding your work experience, you can specify that on your profile or put it in your resume so employers would know that you do have some job experience. How can I get my account “facebook verified” I already connected my account to facebook pero mababa pa rin ang ID Proof ko. No Facebook verified that shows on my profile. Can I re-verify it or something. For Facebook verification, please email support@onlinejobs.ph . Include your jobseeker profile and your Fb profile. Can anyone teach me please. Im taking the IQ test then nagka problem s connection ko. Hindi ko n maaccess ulit yung IQtest. Paano po yun? Salamat po sa mga maaaring sumagot at tumulong. Hi. I understand that the gov. ID is necessary for verification purposes, but I am hesitant to post it because I’m afraid that somebody might try to steal the information. Could you tell me what are the details that would be visible to the client/anybody? Only your photo and name would be visible. We blur out the other details. And if you want to be extra sure, you can upload an image of the ID with the details you don’t want seen already blurred out. I currently applied at onlinejobs.ph, and I am aware of the ID proof thing. But I am hesitant to post my Government issued ID for personal information security purposes, though I am asking, is it really safe if I post it? Yes, it’s safe. We blur out information before posting. You can even choose to blur out the information that you don’t want to share. Does the photo quality of a Government ID upload affect ID Score? What else can I do to increase ID Score? No, the photo quality does’t affect ID Proof score. 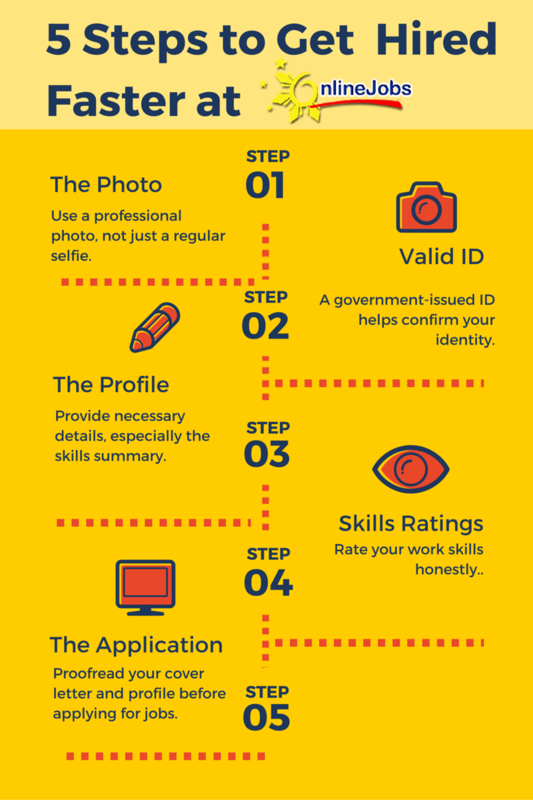 What affects ID Proof is when you provide complete information and you have an honest jobseeker profile. just done reading your article and most of the comments. i’m done with the registration, been a member for a week now., but no luck finding a job since id proof is low., i reckon its 8. Question is how to increase id proof and how to contact employer so i can send my resume. I applied for a job on this website on the 14th. I checked today and found out that the job is still available. I was overthinking the whole day and decided to send another application but this time, I made sure that it’s more detailed and sincere. Did I do the right thing? 🙁 Your response would be greatly appreciated. Yes. But I think it would be better that next time make sure that all your applications are detailed and sincere. I apply today and hope will be hired immediately. What will I do to get the job Im looking for? I just want to ask if I can use my facebook profile as my website URL? 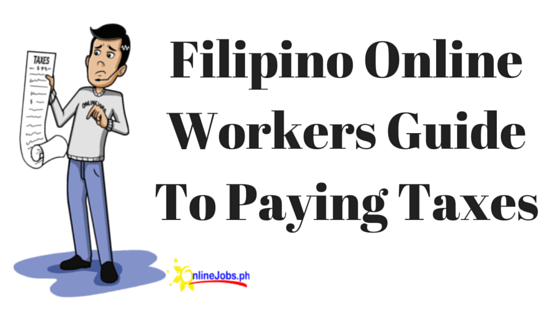 Bago lang po kasi ako sa onlinejobs and wala pa rin po akong experience sa pagiging VA kaya wala po akong website na mailagay. may effect po ba sa ID proof kapag hindi ako nag lagay ng website?.Thank you. No, you don’t need to put your Fb URL there. The website URL is optional and it won’t affect your ID proof score. Good evening Maam Julia. I am new to onlinejobs.ph, and I’m having trouble syncing my facebook account to my jobseeker account. I searched through internet and found this blog, and I followed your steps. The problem is, I can’t find the said link that will prompt me to connect my facebook account to my jobseeker account. Where can I find this link maam? Hoping for your answer. Thank you. God bless! Hi Dean! Please email our support staff (support@onlinejobs.ph). They can help you sync your Facebook profile with your jobseeker account. Please email support@onlinejobs.ph. They can help you with uploading your government ID. Thank you for your interest in Onlinejobs.ph. Unfortunately, at the moment we’re focusing in providing jobs mainly for Filipinos based in the Philippines. For online jobs within your country, you can try signing up for UpWork or Freelancer. Hi Ma’am, I have been trying many times to upload a government ID. First, I select the file and then I click the upload image, then it goes back to My profile view page, and when I go back to Home, my ID hasn’t been uploaded. I tried clicking the “watch this video” first, but I can’t access it. I’ve been trying more than 10 times already and for many days in uploading the picture, but to no avail. May I ask pls how can I upload my Government ID. PLease email support@onlinejobs.ph. They can help you with the process of uploading your ID. I have a client that tell me to create a designs., and I asked to have an agreement to pay upfront or do invoices. And she just respond me back that she gonna make a complaint about it. Hi! I just registered you’re site and hoping to get a job but I felt my skills are not enough. I used to work in a call center for 5 years, administrative assitant in a school, ESL teacher and telemarketer.Is there any free training in skills like for SEO I really want to learn and expand my knowledge so that I’m confident to apply with job that I want. Most of the sites who offer this course in digital marketing let say they require credit card and I don’t use my ccrd online at all to avoid fraud I’m not saying all sites like this are scammers. I notice most of the companies requires you to have a knowledge with SEO most of the categories it was stated. Any recommendations which website or link that I can learn SEO and I’m so eager to learn this skill. I always stay positive to get a job and I don’t lose hope jsut keep on going. Thanks! data encoders and i dont know how can i send my resume. My ID Proof used to be in 90 already but when I link my FB account to my onlinejobs.ph account, it suddenly becomes 33 and I can’t seem to find why it goes down suddenly like that. Can somebody help me what should I do with it? Please email support@onlinejobs.ph . They can help you with your IDProof. I have been registered to onlinejobs.ph three months ago and until now I still haven’t got hired by some employers…. what should I do? did I missed something to get recognized or there’s something wrong with my application? I just want to work as a data entry for a start… and later on, I will level up my skills in the field of Information technology. I need help because I need to work as soon as possible. Thank you for giving time to read my letter. I received a message from an employer saying that he needed a VA who can write articles for him and manage his SNS accounts. He said that when he saw my profile, he knew that I was perfect for the job. I had been sending out applications but not to this particuar job post because I hadn’t seen the job ad in my feed. I checked the job ad and it did exist. I told him that I could only work for 5 hours a day. He said it was fine with him. I was shortlisted. He gave me a trial task and he said the output was good. He asked for my rate and I told him so. I also said that I wanted a weekly pay, having read a tip about it in one of the blogs. He gave me a list of articles to write. I ended up devoting 10-12 hours a day instead of 5 to complete the tasks, doing research, writing articles and summarizing them in a spreadsheet to make everything organized, something that he didn’t ask me to do. That was the extent of my dedication to my work. I was enjoying what I was doing. I sent him daily updates but he seldom replied. Sometimes it would take him days to reply. He apologized one day and said that he had been busy. I did a follow up on my payment but he seemed to not read the bit about my salary when he replied to my e-mails. I have verified his account and he has a paid one with no active job ads and no complaints. I am already at a loss on what to do. I have been asking for my payment politely. I’m afraid that if I ask for it one more time, I’d annoy him and he would fire me. I don’t think he’s a scammer. He seems so nice. I forgot to mention. My profile doesn’t show that he has hired me. That’s another issue that worries me. We talk about work through e-mail only. He would have to login to his employer profile in order to mark you as hired. Just remind him about this so he can bookmark your profile. Don’t be afraid to ask. But if you’re really concerned and this continues to happen despite the reminders, you can email support@onlinejobs.ph and request for mediation. I would like to ask if there is a cap of sending applications? I already sent three applications on different dates just because I did not hear any response from the employers. Would my ID score be affected if I keep on sending applications? There is a cap but based on how often you’re sending our applications, it’s the normal amount. As long as you don’t send several applications on the same day, your IDProof won’t be affected. My partner have encountered the same issue with other job seekers regarding the id proof. You uploaded your gov id’s took the exams and all but still got a zero or low id proof. what we did was we just emailed the support team and told them our problems with the id proof, they even have a live chat here. you can see that on the lower left hand side of the screen. They will respond immediately when they have agents available. They will just manually approved your Facebook connect and in an instant your id proof will be higher. Don’t worry onlinejobs,ph is legit, you can also check the employer if they are legit you can check that on employer look ups. I did that to my current employer. I am getting paid via paypal. I created my account Sept 20,2017 morning and applied for job in the afternoon, in the evening i got an interview request and got hired on the spot same day. Thank you onlinejobs.ph. Where do I get the link or pdf to my SKILLS ranking I completed with OnlineJobs. Do you mean your ranking when you take a test or the actual skills ranking on your Onlinejobs.ph profile? I do not have a driver’s license, SSS id, Voter’s ID, etc. yet, as I am still a student and and do not have the time to acquire those yet. Can I use my student ID as a government ID? I go to a state university if it counts. Yes, you can use your student ID as your government ID. I’d just like to ask why I cant seem to upload my Profile Picture on Onlinejobs.ph. I have tried almost twenty times already, and yet I just can’t upload the image. The image size is around 2-3MB. Jpeg format. I am currently completing my account. This sounds like a technical problem. Please email support@onlinejobs.ph. They can help facilitate the process for you. I have been working with the bpo industry for clise to 10 yrs, untill the company i was working for closed up last year. Unfortunately , i was diagnosed with a condition called Spasmodic dysphonia which affected my vocal chords, making it very difficult for me to speak clearly. Right now, i cannot find a job because of my condition. I would be very happy if i could work at home. However, i have no experience doing homebased jobs and i am very anxious that applying will require me to go through an interview, and i cannot do it because of my condition.. Is there any possibility of landing a job without having to go through an interview? Please enlighten me.. I am new here in onlinejobs.ph I would like to ask why when I select a certain job then click Apply button there’s a caution below the Job Application “Don’t apply to jobs you’re not qualified for. Doing so may affect your ID Proof score.”, because I did a higher ID Proof score (ID Proof: 90) compare to the job I applied (ID Proof: 50). Please answer following questions below. 1. Is it possible that it could affect my ID Proof score lower down? 2. If there are no available jobs for my ID Proof score how can I apply a certain job? Thanks you and please advise some. 1. Is it possible that it could affect my ID Proof score lower down? If you apply for jobs that are below or equal to your ID score, no, it won’t lower your score. What will affect your score is if you apply for jobs with a higher ID Proof score or you apply for jobs you are obviously not qualified for. 2. If there are no available jobs for my ID Proof score how can I apply a certain job? Once you have completed your jobseeker profile, you should have an IDProof score that would allow you to apply for most jobs. The only way your score would be too low is if you don’t complete your profile and your leave out a lot of important information. for “OR USE TEMPLATE” blank tab? For the SUBJECT tab, make sure you read the job post. often the employers would specify what you should write there in order for them to consider your application. Otherwise, you should write down what job you are applying for. “OR USE A TEMPLATE” is when you send out multiple applications. If all your application emails contain the same text, you can save it as a template. I am having issues uploading my Government I.D. I followed all the steps. Can I use my Voter’s ID as my government ID? I also want to know if it’s okay that I still use my maiden name? I am married for almost 2 years but I haven’t updated my Civil Status. But in my facebook account, you will see that I am married and my name is updated (not my maiden name). I’m just worried because maybe it could result to low ID Proof. I also want to know if it’s okay that I still use my maiden name? – Yes. What’s more important is that the name matches the ID. Thank you. I have already uploaded my government id and connected my facebook account. Instantly, it gives me an IdProof of 80. This tested your level of English grammar and vocabulary. Is this the actual test? Could I just take a screenshot of the email and then upload it to my profile? or do I have to take a new test? Your answer will be much appreciated. Thank you in advance. This happen to me as well, I did a screenshot and upload it to my profile, hope this helps. Also same thing happen in my facebook link the moment I connect it to my profile. I am new to OnlineJobs. May I ask if there is a minimum and maximum to apply to a several Jobs? it has been stated that I have been already applied 10/10….In just 1 day. .and I understand, I can’t make a multiple accounts..Hope to hear from you soon.. i need your help. I just created an account with OnlineJobs. May I ask if it is allowed to apply for a part-time job even if you currently have a full-time job? Hello! Can you help me how to recover my password? I accidentally forgot it, can I make new one or any suggestions in order to solve this problem. I’ve created my account last June 2018. Thanks you for this link I saw in google, facebook post then clicked these link. ID Proof already increase after I’ve connected that link to facebook. Thanks, hoping to fine a job soon! Thank you for this link I saw in google, facebook post then clicked these limks. Thanks, hoping to find an online job soon! There is no minimum but there is a maximum limit you can apply for in a day, 10 applications. This is to ensure that the employers are mot flooded with applications and to control spamming. Thank you for your response Ms.Julia. How to land a job here? I would like to ask help on how to increase my ID Proof from 69 to 70? Hoping for your reply soon. How do I know about the status of a job application I submitted? The system doesn’t seem to have this feature. Am I right? Our system currently doesn’t have this feature since all applications are sent directly to employers through email. However, you can contact the employer through email to follow up on the status of your application. hi mam I already update my profile and take some test , i am applying for the position of data entry and it says that “Your ID Proof is lower than required to apply to this job.” I already finished all the test and profile, how many days do i need to wait to update my profile. Been searching a home base job online since December last year, I got a job, unfortunately, it was a scam twice, so now zero balance na ako, and im renting, hope you can help me land a job here. really could use some help here. Thank you.